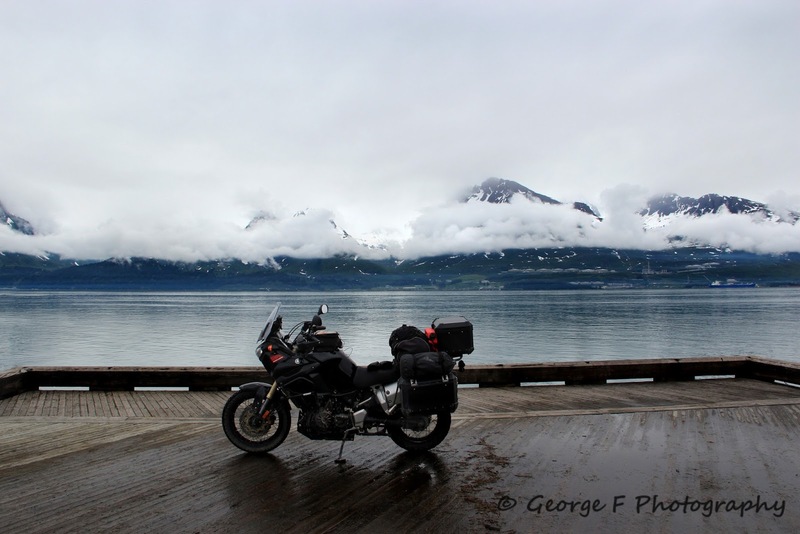 I left Copper Center early in the morning, planning on riding to Valdez, about 150 miles, and have breakfast or lunch there. 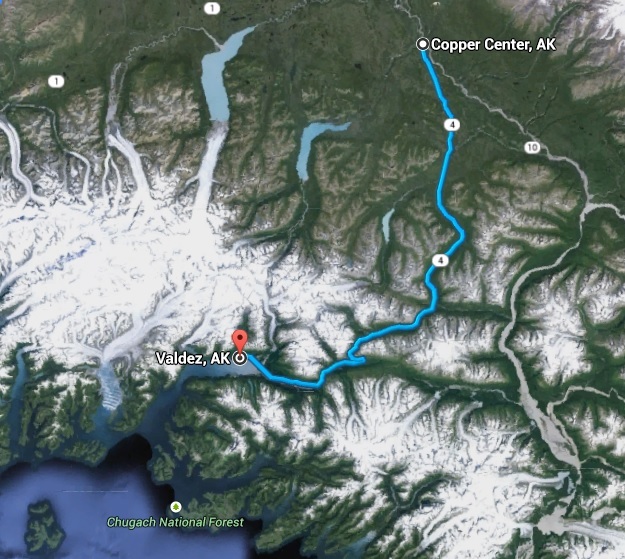 I will then turn around and head north passing Copper Center again on the way north to Tok, another 255 miles. 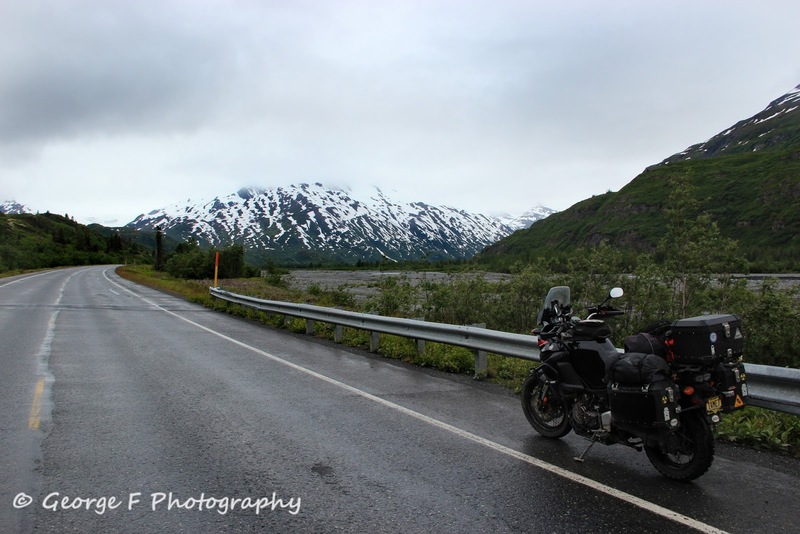 There's only one road to Valdez, the Richardson Highway, but it's one of the most beautiful rides in Alaska. 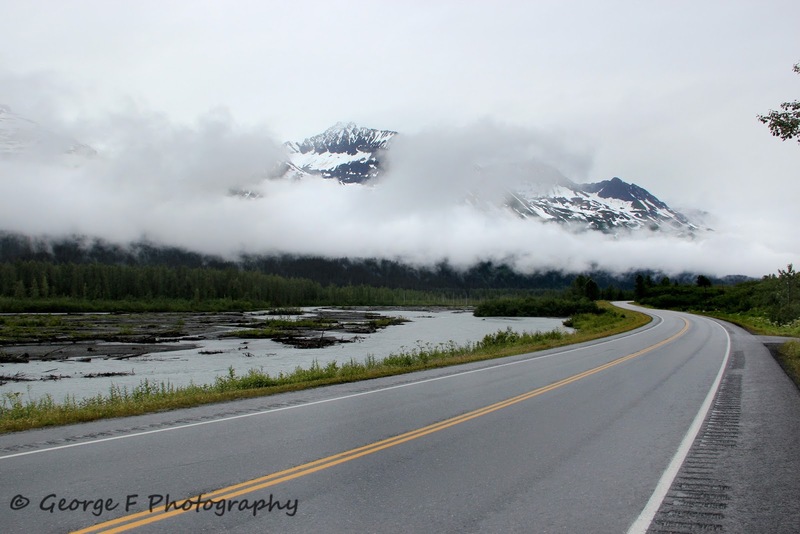 The views are stunning, the snow capped mountains surround you most of the way and there's a constant fog. 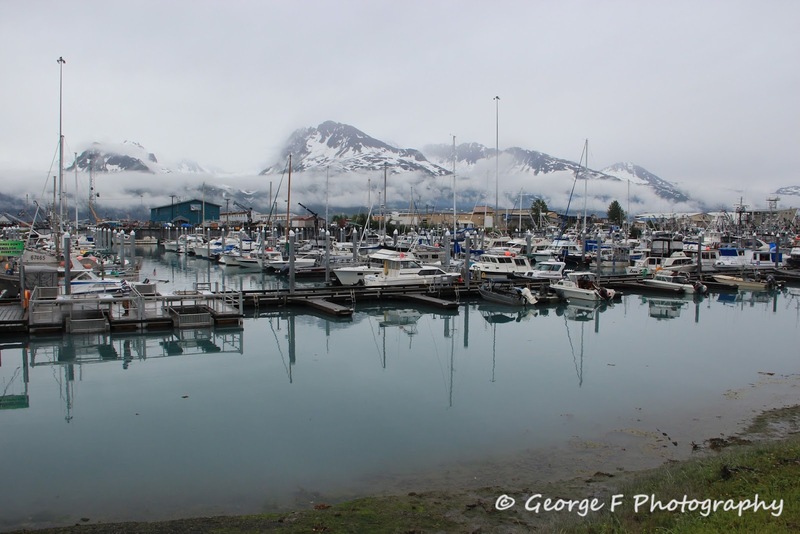 Valdez is a small city of about 4000 inhabitants but has one of the most important ports in Alaska. 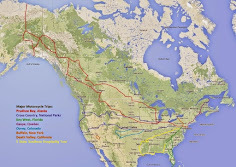 It is also the end of the oil pipeline that starts in Prudhoe Bay, the place I had been just a few days earlier. 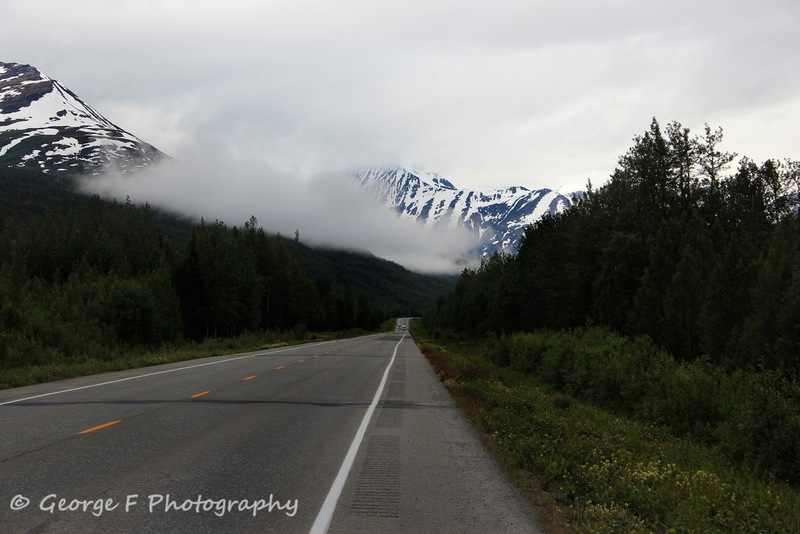 The vistas are stunning along the Thompson Pass, it's mid July but the mountains are still topped with snow and the fog is a constant along the way, it made for a very cold ride. I had my scarf wrapped around my neck, had to put and extra layer under the jacket and the grip heaters were on maximum setting. 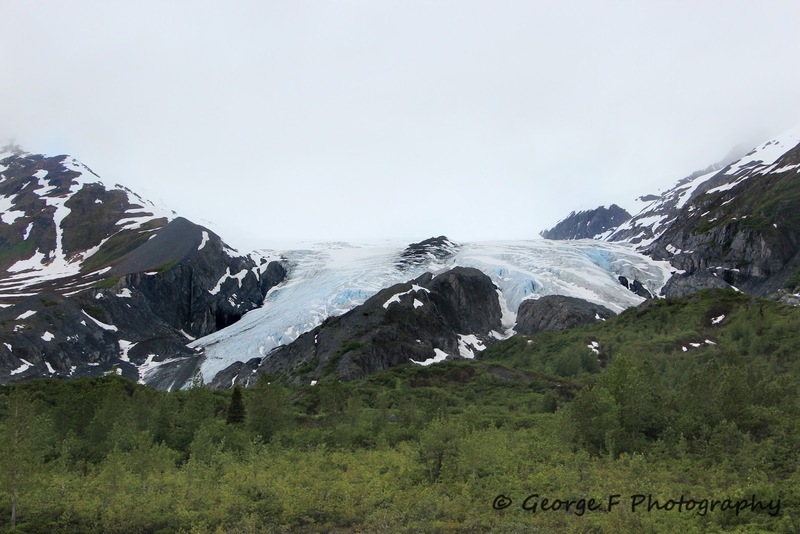 About 30 miles before Valdez you pass the Worthington Glacier. 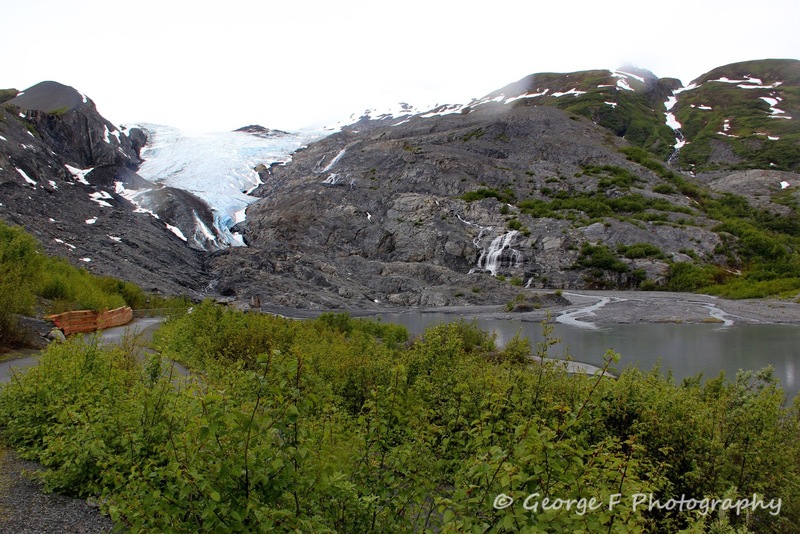 I stopped at the state recreation site but did not walk all the way to the glacier. 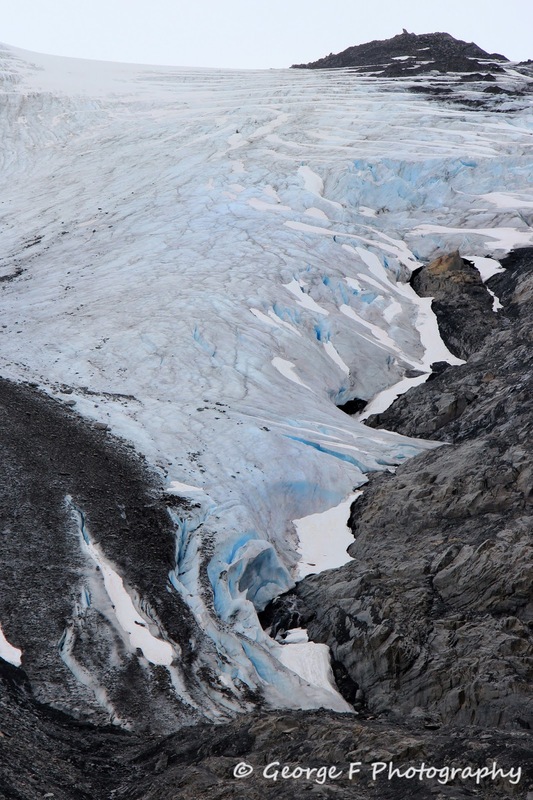 The sign said it's unsafe to walk on glaciers without special equipment due to the danger of falling in a crevasse, the last thing I wanted after having ridden over 6000 miles so far on this trip was to break a leg by falling through a crevasse. 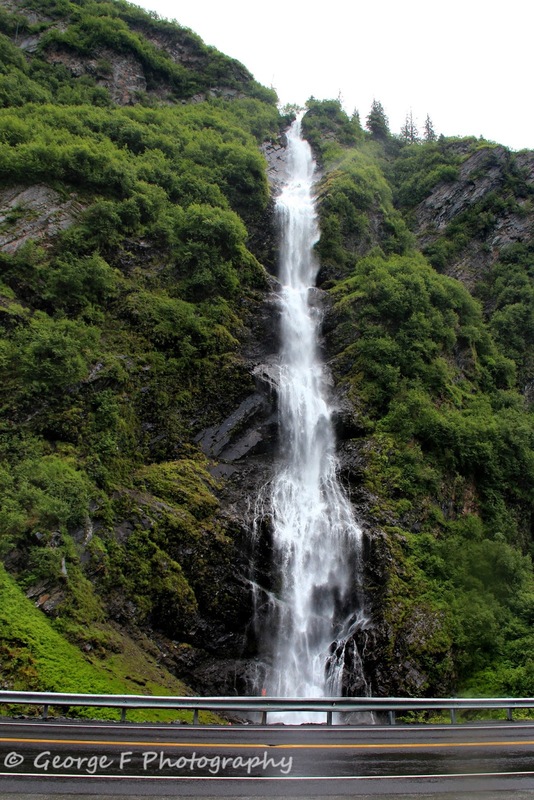 As you get closer to Valdez you go through Keystone Canyon, carved by the Lowe River, where you get to see lots of beautiful waterfalls. 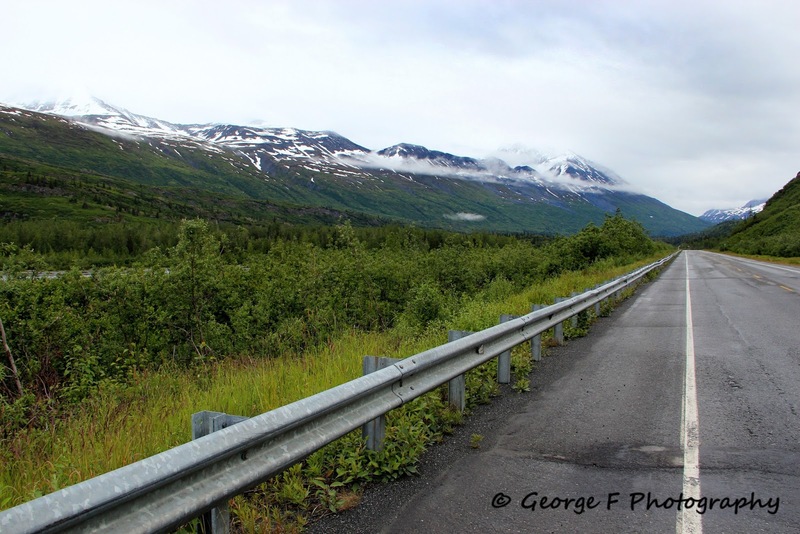 It's a narrow Canyon and I encounter almost no traffic, at one point I stop the bike and I'm able to stand in the middle of the road to capture a few pictures. 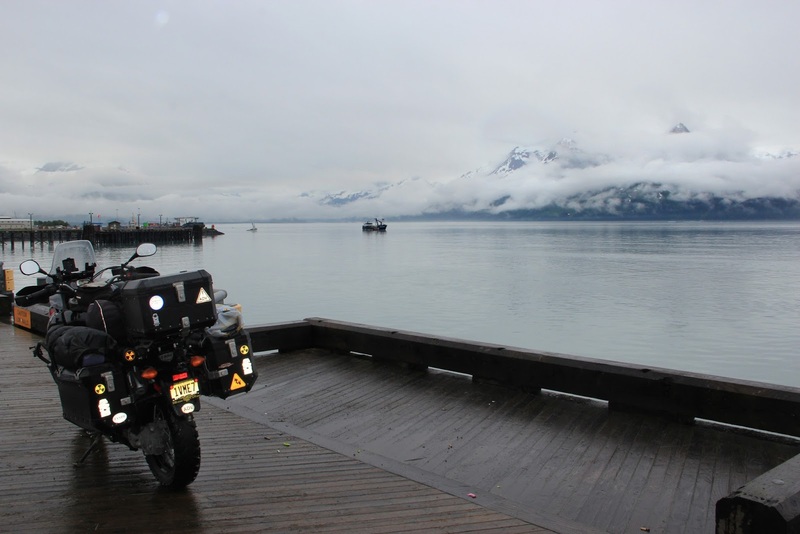 The air was cold, mid 40's, colder than when I was further north and colder than Prudhoe Bay but I was enjoying myself just admiring the beautiful scenery and the low fog. 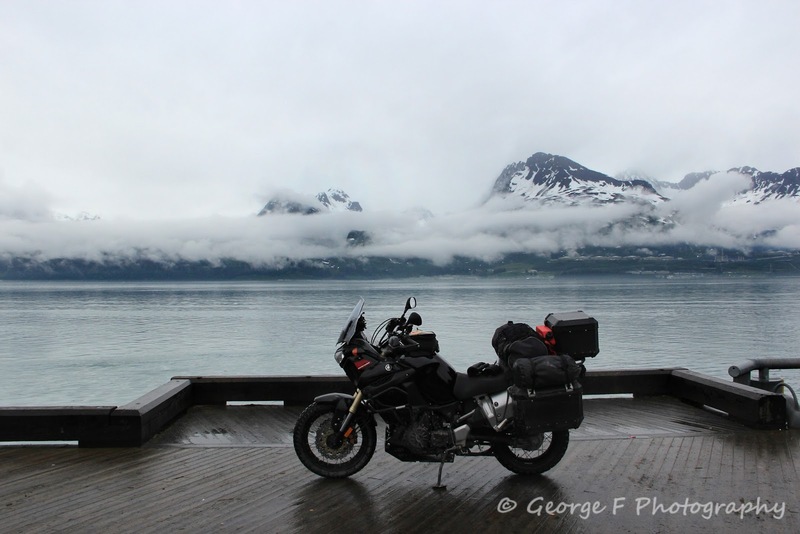 I arrive in Valdez, located at the head of a fjord on the eastern side of Prince William Sound, head straight to the ferry terminal and ride my bike onto the pier, luckily for me the ferry was not in and there was no one at the terminal. 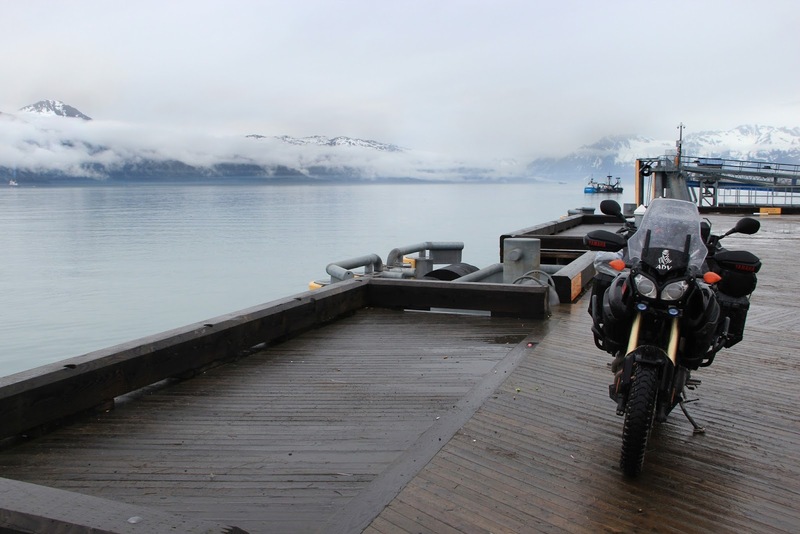 I had envisioned this moment multiple times in my head and found a perfect spot on the empty pier. Right across from where my bike is parked is the oil loading terminal. No one is allowed to go near but I didn't need to, the view from this side was amazing, I stood there for a while simply enjoying life. Below you can see an oil tanker on the other side. 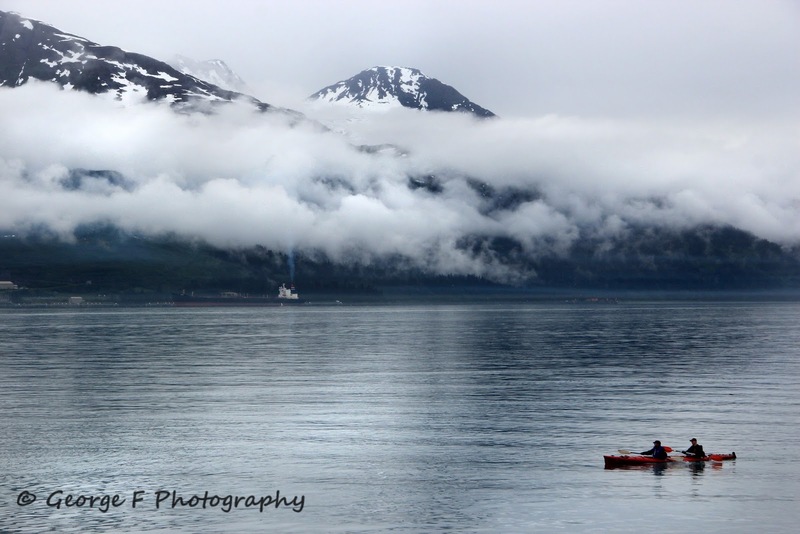 These two guys were leisurely going by on their canoe. 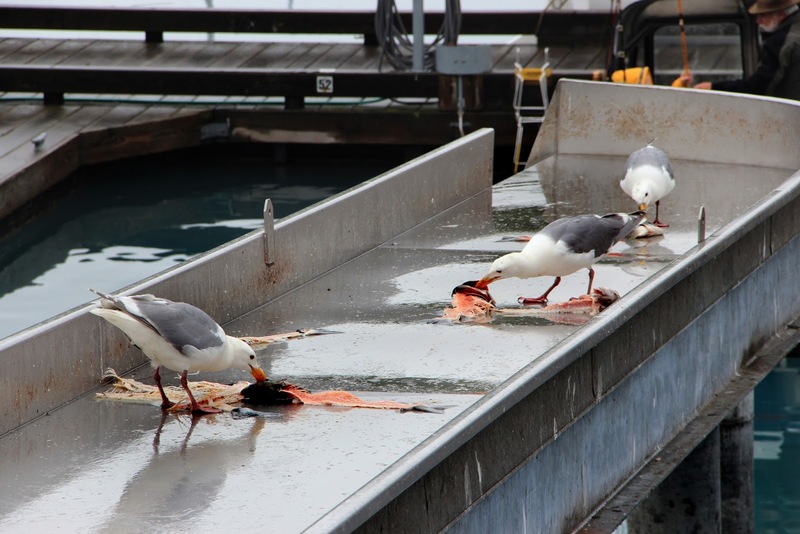 These guys were having fun picking the bones of leftovers from the fishing boats and seeing them eating remind me that I needed to eat too, I tend to forget when I'm having fun. 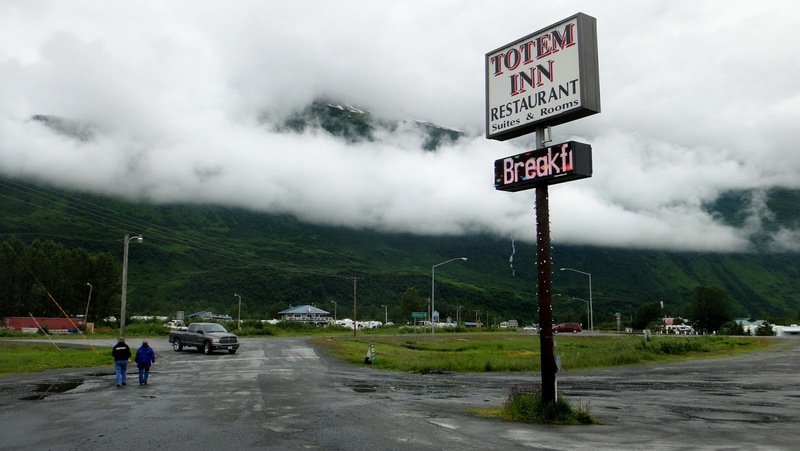 I find the perfect place for breakfast at the Totem Inn Restaurant. The place was packed and that's a good indication the food is good. 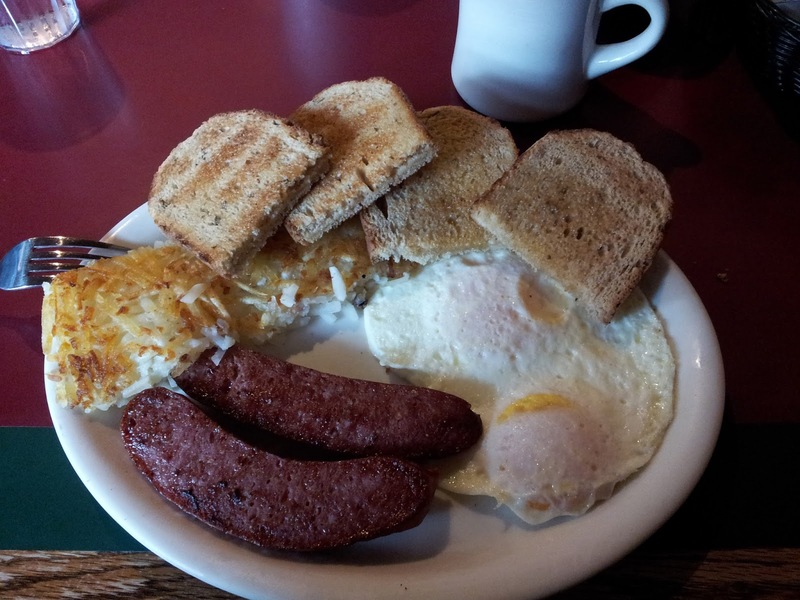 I look through the menu looking for the typical, two eggs and bacon but instead find two eggs and "reindeer" sausage. I had never had reindeer sausage and didn't even know they existed. I ask the young waiter if they are good and she tells me they are the specialty of the house, that was enough for me, I'm always ready to try anything. I can attest they were really good. The view from outside the restaurant. 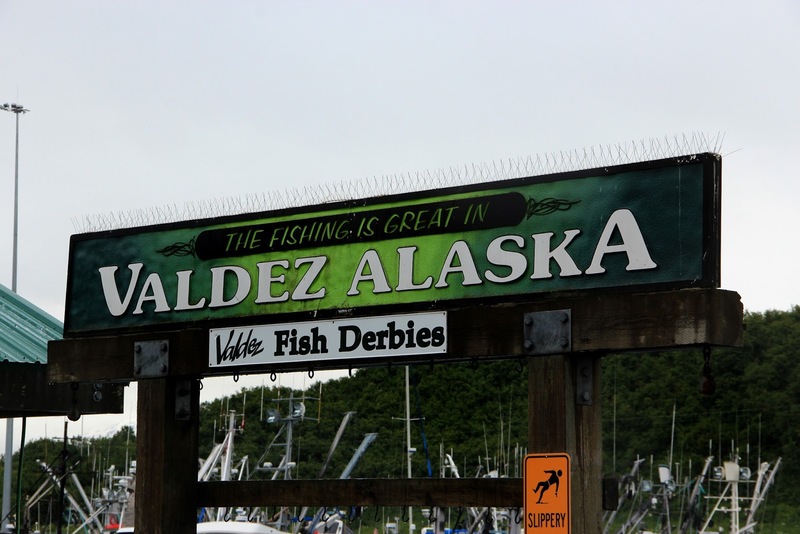 I couldn't leave Valdez without one last stop by the pier. 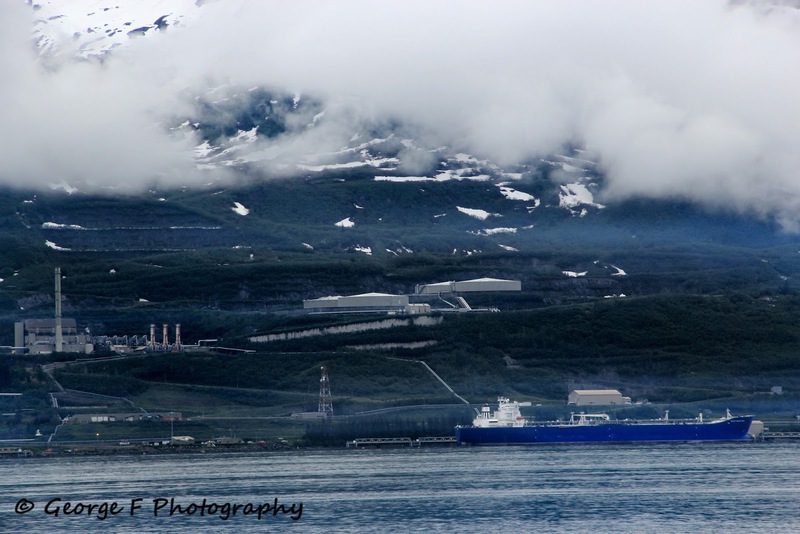 I pull out the zoom and manage to get a closer view of the oil terminal. 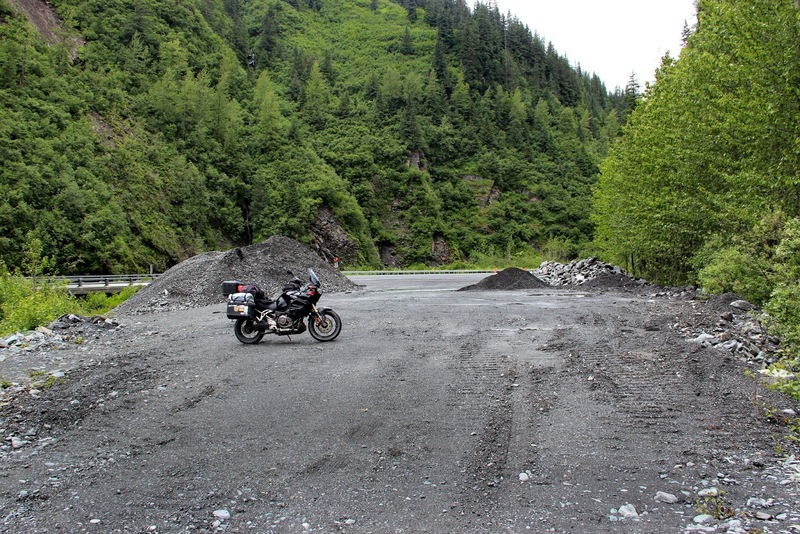 Since I was there, might as well get another photo of the bike. 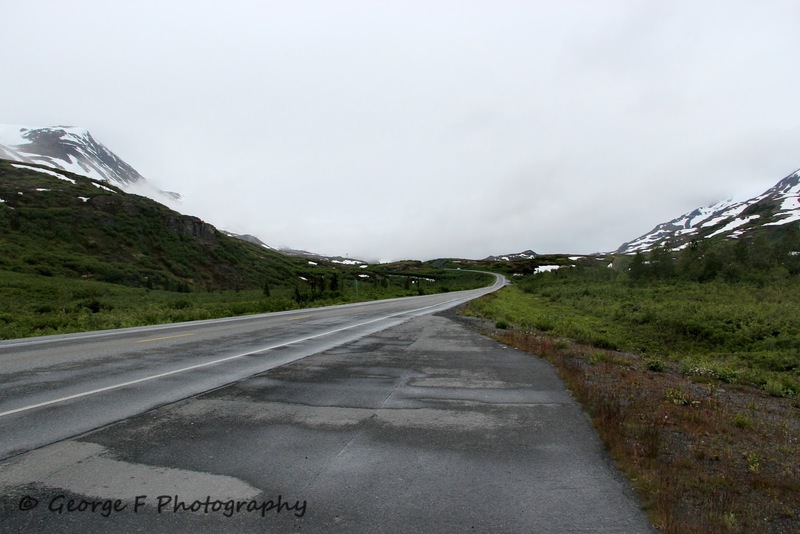 With one last look, I turn around and head out of Valdez and back on to the Richardson Highway. 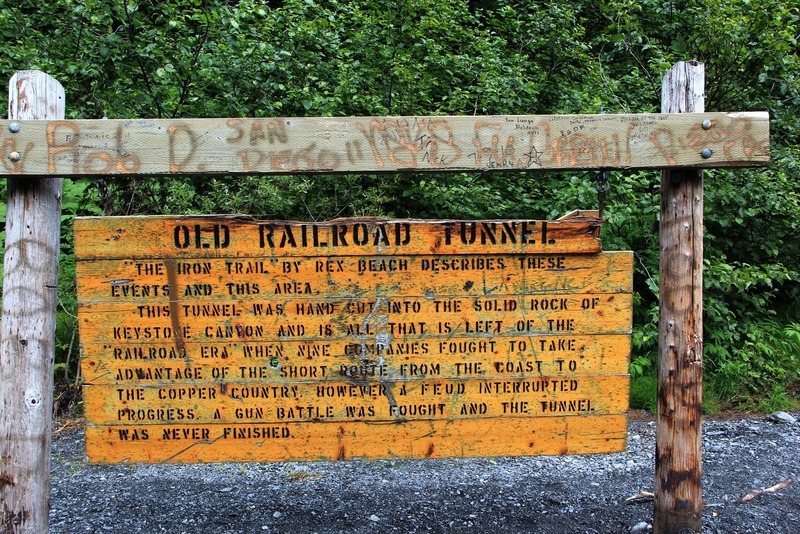 On the way out I stop at the old railroad tunnel, cut by hand into the solid rock, never completed because the workers from competing mines fought a gun battle which interrupted progress and the tunnel was never finished. 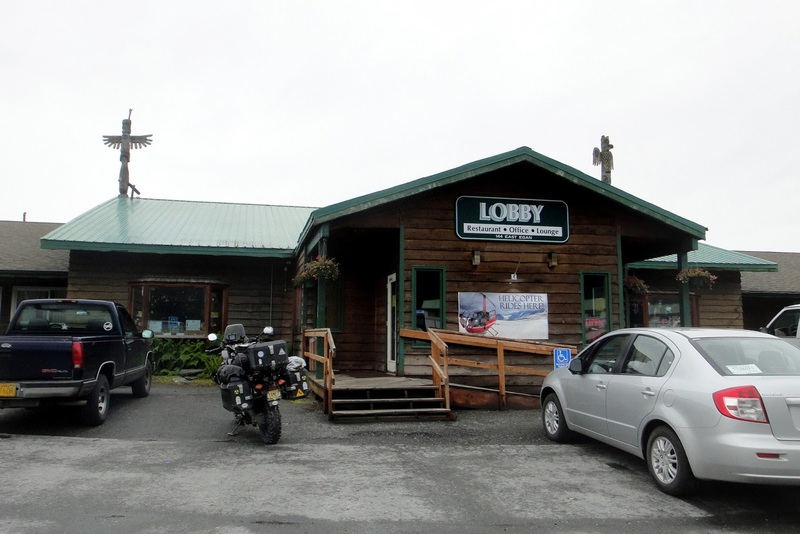 I continue my return to Tok where I plan on spending the night at a famous motorcycle campsite. 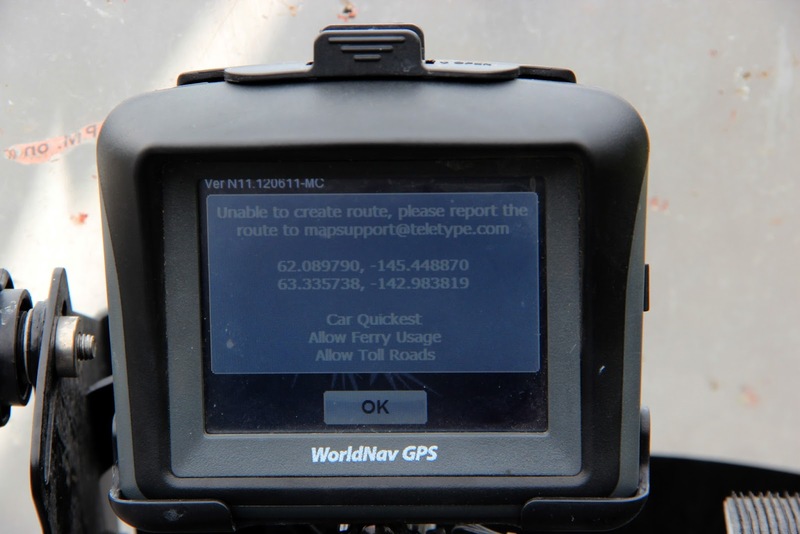 Luckily there's only one route to follow back to Tok because my WorldNav GPS was having problems locating itself. 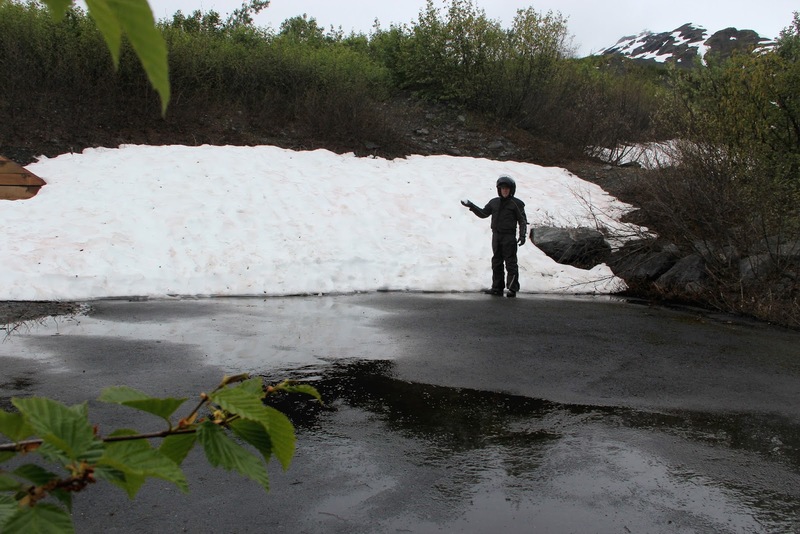 I never figured out what the problem was, it had the maps for Alaska and had been working fine further north. 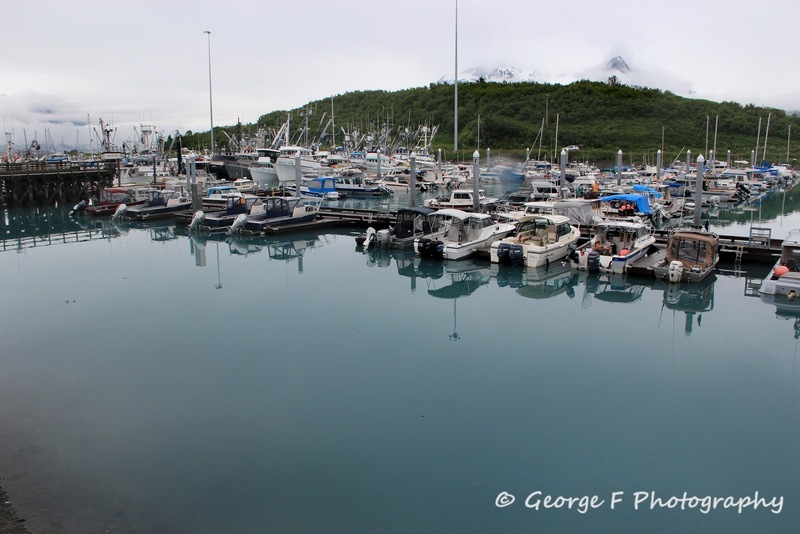 George--This is a beautiful and wonderful online journal of your travels. 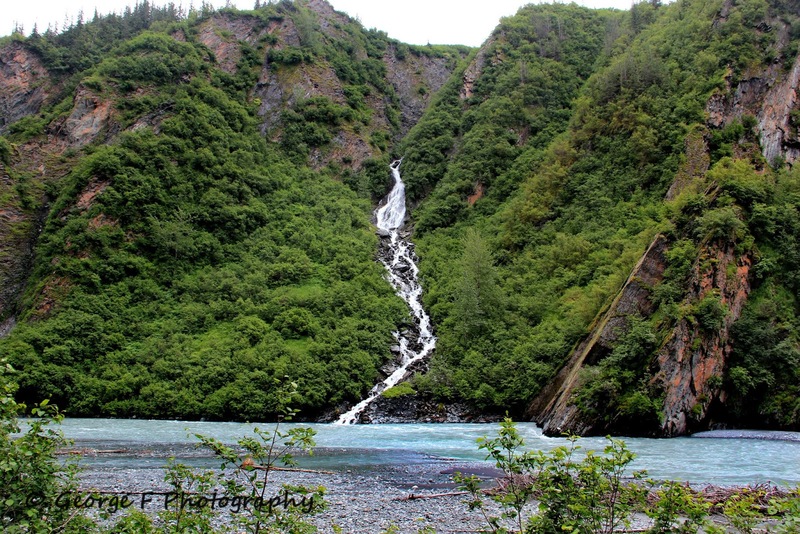 My dad took me to Valdez many years ago ('82) and your pictures of the various falls along the way gave me a smile. 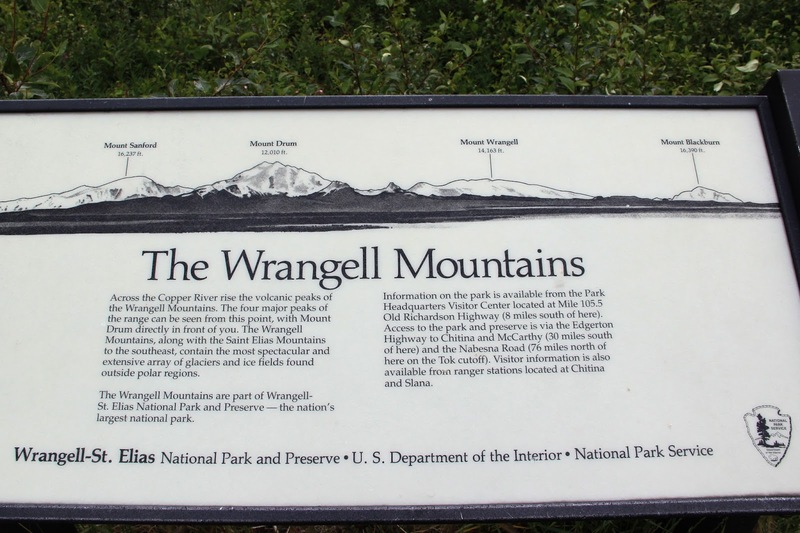 Made me ask myself, "Is that Horsetail, Bridlevail, or one of the many others along the way?" Dawn, glad you enjoyed it, thank you for reading. 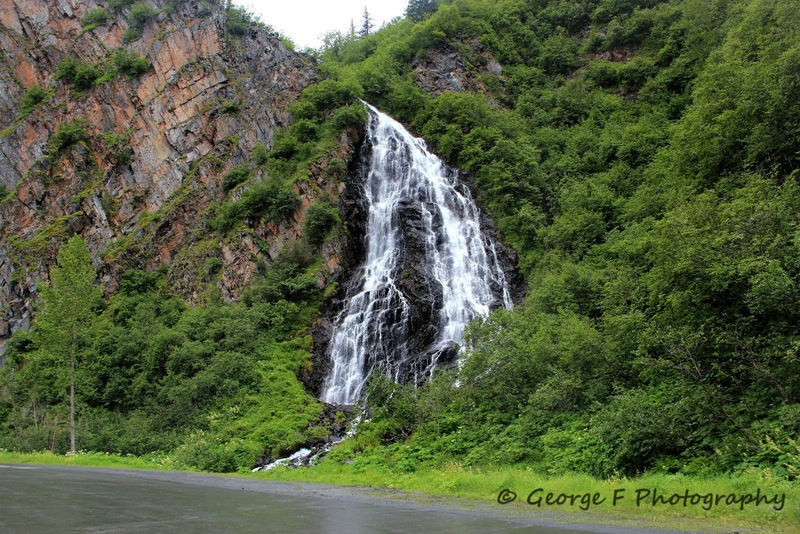 I don't know the names of the falls but they are beautiful and I had a wonderful trip. 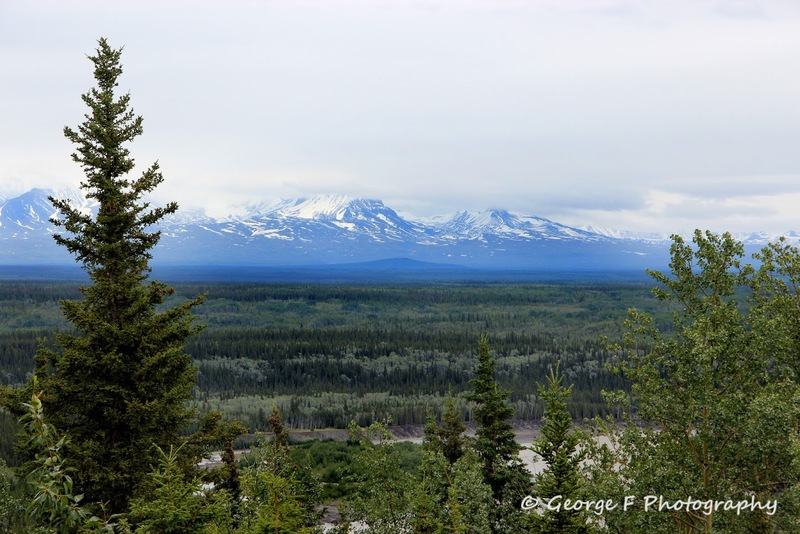 I would love to go back and explore the coast past Anchorage and south of it. 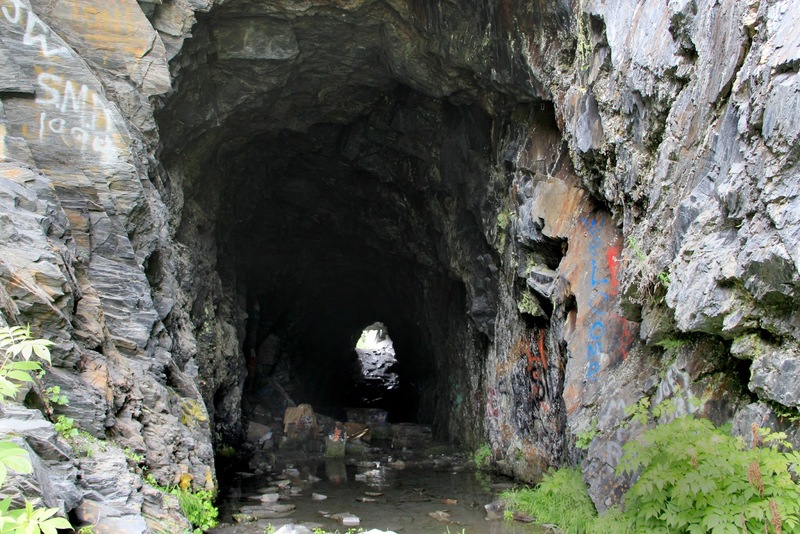 You should try to go back. Thanks Richard. 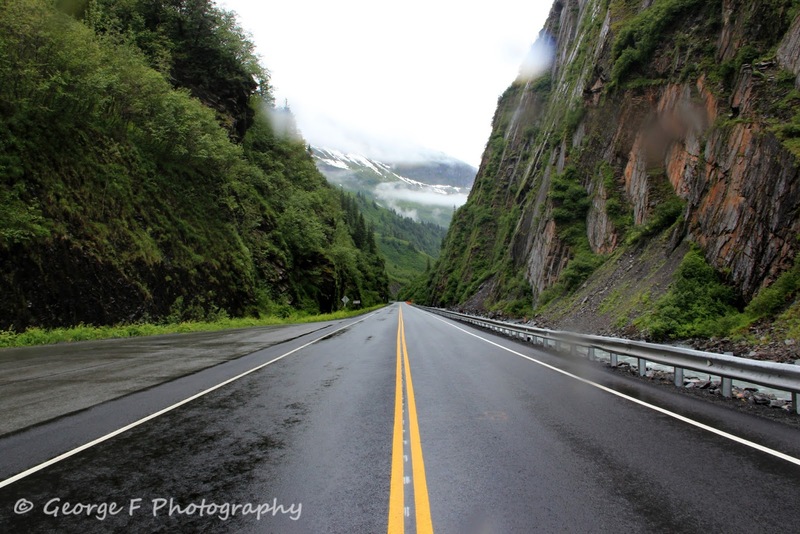 Yea, I assume it rains a lot in Valdez and that's why there's the constant fog. What is the camping window, month of July only? I assume it's always cold and humid there.